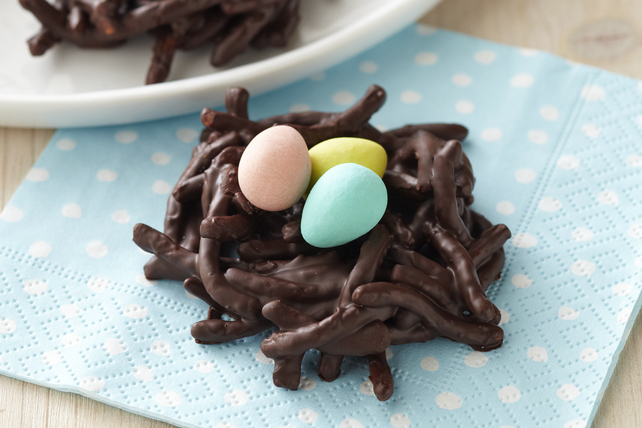 Celebrate spring with our BAKER'S Chocolate Nests. These sweet Easter treats are fun to make and tasty too - perfect for kids of all ages. Microwave chocolate in large microwaveable bowl on MEDIUM 2 to 3 min. or until almost melted; stir until completely melted. Stir in noodles. Drop heaping tablespoonfuls of noodle mixture onto parchment- or waxed paper-covered baking sheets; indent centres slightly to resemble nests. Fill with Mini Eggs. Add 1 cup peanuts to melted chocolate with the noodles.